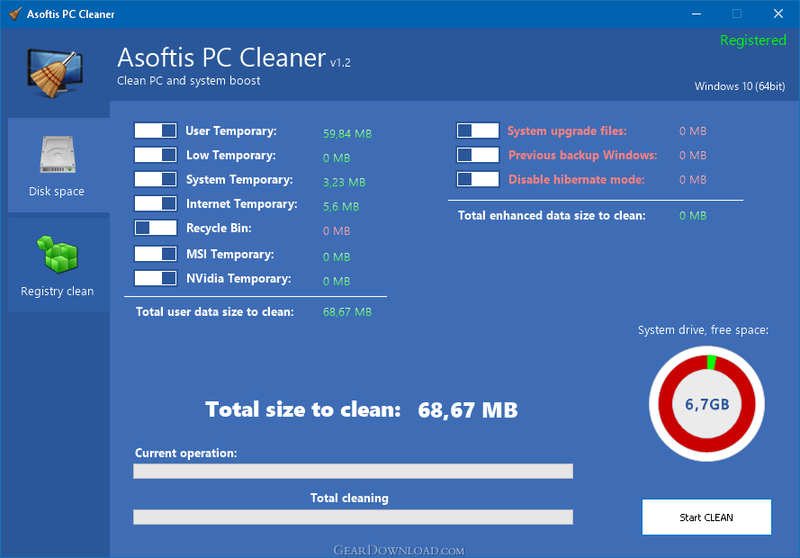 Asoftis PC Cleaner is designed to make cleaning up a PC as easy as possible. All drive clean-up options are located in one place, which gives you a unique view of where most data to be deleted reside and how much drive space you get. The application supports all types of hard drives and is suitable for SSD, HDD and also hybrid SSHD. Forget about onerous browsing of folders and looking for files to be deleted. Remove unnecessary files which take up drive space. Cleaning up the system registry speeds up PC performance and removes invalid entries left behind by applications which uselessly take up memory space and which the system has to deal with. You dont need to look for a Windows feature to remove redundant system installations or performed updates anymore. The application enables you to delete files of performed updates and previous Windows installations which are not needed anymore. Cleaning up a computer is just one click away. Use of the application is intuitive and even a computer layman will be able to perform a professional PC clean-up. This download (ACleanerSetup.exe) was tested thoroughly and was found 100% clean. Click "Report Spyware" link on the top if you found this software contains any form of malware, including but not limited to: spyware, viruses, trojans and backdoors. Casper RAM Cleaner 2.3 - Casper RAM Cleaner increases your system performance. Serial Splitter 3.0 - Enable all applications to receive same data from a serial port simultaneously. PC Tweaker 2.20 - Using PC Tweaker you can improve software and internet connection productivity. Actions Monitor 1.02 - Monitor and display system activity. ActiveStartup 1.45 - Windows startup manager. Supports backup/restore configurations. Key Transformation 8.1701 - Customize keyboard layout; Change key on keyboard; On screen keyboard. SystemAI 1.5 - SystemAI™ creates an ideal virtual computer for each of your applications. Fast PC 1.0 - Fast PC makes your PC faster, error-free and more efficient!